This is a fabulous and healthy salad that will brighten up any meal. I was outside this morning and noticed my little pomegranate tree is full of blooms with little pomegranates in the making. We’re hoping for a bumper crop this year. 🙂 It got me excited so I decided to post this recipe from last Fall. 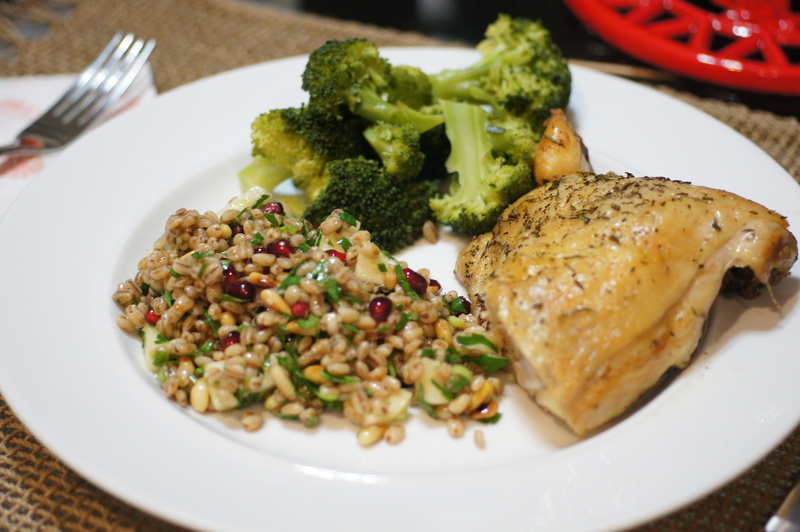 This is a really nice recipe that utilizes an underused product, barley. Most people think about using barley in soups but barley is a versatile grain. You can use it like any other grain such as couscous or rice. You can serve barley instead of rice with a curry or stir-fry. You can also make a barley pilaf and there are even recipes for barley risotto. The best thing about barley is it just tastes good. This salad (modified from a Food & Wine recipe) is a wonderful example. You get the nice chewy texture with the nutty taste coupled with the sweetness and tartness of the apple and pomegranate, the crispness of the apple, the crunch of the pomegranate seeds, the freshness of the lemon juice, the savoriness of the chicken broth and shallot and the butteriness of the pine nuts. Baby Lady loved to take this to work for lunch. It also works well as a side with other dishes. Give this salad a try. It might inspire you to try other barley dishes. For the Barley: Place a large saucepan over medium heat. When hot add 2 Tbsp olive oil and immediately add the pearled barley. Cook over medium heat, stirring frequently, until lightly toasted. Hint, the grains will turn slightly opaque just before browning. Add the onion and thyme to the saucepan and cook over low heat, stirring occasionally, until the onion is softened, roughly 5 minutes. Add 3 cups good chicken stock, preferably homemade, and 1 teaspoon of kosher salt. Bring the mixture to a boil. Once it boils, Cover and reduce the heat to very low. Cook over very low heat until the water is absorbed and the grains are tender, roughly 30-40 minutes. Be careful not to overcook the barley. When cooked, barley has a chewy texture and nutty flavor, similar to brown rice. Fluff the barley and discard the thyme sprigs. Allow the pearled barley to cool. For the Salad: Seed a pomegranate, measure out 1/2 cup and set aside. Next, peel and core the apple. Cut it into 1/2 inch pieces and set aside. Put the pine nuts in a pie tin or cookie sheet. Preheat the oven to 350° and toast the pine nuts until golden, about 5 minutes. When done, set aside and let cool. In a large bowl, whisk the oil with the lemon juice and shallot to emulsify. Season with salt and pepper to taste. 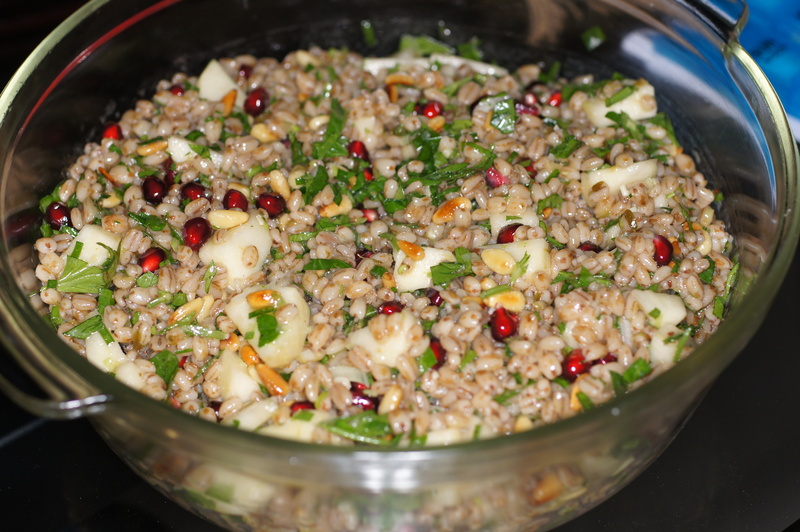 Add the pearled barley, pine nuts, apple, pomegranate seeds and parsley. Toss to incorporate. Serve and enjoy! Thanks for dropping by and your nice comment. Give it a try. I think you will be impressed with all of the flavors. It’s really nice. Nice looking salad. What do you feed your pomegranate tree? Ours is a bit sad, not producing fruit, seen one only and that was last year! We just placed it in the ground. The only fertilizer we have used is whatever we have placed on the grass. It has grown beautifully. We just make sure it gets a lot of water.